This performance is an immersive audiovisual experience, using hacked scientific technology as an artistic medium. The analog visuals derive from an oscilloscope, which generate light from electromagnetic fields deflecting electron beams. These warm and organic images are transformed via computer vision into real-time motion data, which drive the generative sound system. The audience is invited to immerse themselves in the intricate layers of the soundscape and organic visual textures that explore symmetry and randomness, deliberation and serendipity. A diffuse reflection from the surface is the primary mechanism by which objects are revealed to our eyes: the light allows us to see the world around us, the reality is revealed to our eyes thanks to this interaction. 空 Kū is part of an ongoing research focusing on what happens in the previous phase of this interaction. A journey into pure light, before it gets to enlighten other, the real objects. What we see projected during the performance is the moment in which these points of light will light up. There is no numerical processing between the light source and the projection: it is a direct recording. 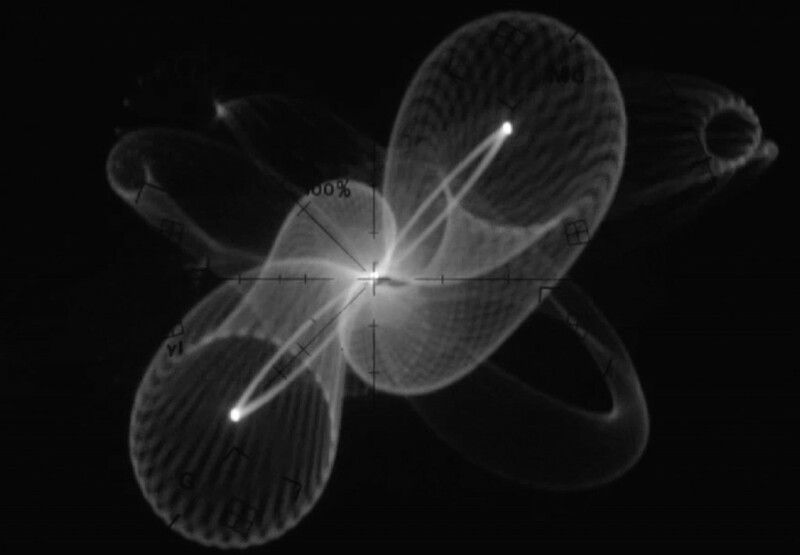 The processing and manipulation takes place before, in the generation of the source signal and as result of the performance action: it is thus possible to use an electron beam deflected by an electromagnetic field to generate these drawings. The output is an analog image, no quantization processes involved. 空 Kū (most often translated as “Void”, but also meaning “Sky” or “Heaven”) represents those things beyond our everyday experience, particularly those things composed of pure energy. It is of particular importance as the highest of the five elements. Kū represents spirit, thought, and creative energy, as well as our ability to think and to communicate. Kū is not the void in the sense of nothingness, but is a totality, a universal freedom, beyond the normal conditions of existence. aBe: computer vision programming. Abe Pazos Solatie (Finland) is an artist who works in a variety of media. By experimenting with aleatoric processes, he finds that movement reveals an inherent awkwardness, a humour that echoes our own vulnerabilities. He also considers movement as a metaphor for the ever-seeking man who experiences a continuous loss. Presented by CC4AV, a platform for collaborative experiments with technology, sound, design and visual art. CC4AV organises creative coding for live audio and visual workshops in Berlin.